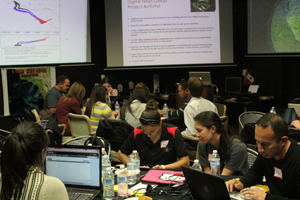 Journalism and geology students working in groups during a workshop. Photo by Kevin Robinson. This post was co-written by Kevin Robinson of San Diego State University. Many reports and articles lately have documented the change of tide in higher education today. Many higher education institutions across the United States are facing declining resources, state budget cuts, decreasing endowments or funds, and an ever-changing student enrollment that swings upward and downward from one semester to the next. "The earlier we can get our students to know about collaboration and working in collaborative, interdisciplinary environments, the more successful they will be when they enter the workplace." These changes impact the academy at large but also all disciplines and fields within it. As a result, teaching and research opportunities can be affected and pushed aside because of lack of resources, time and effort. Thus, creative ideas often come from necessity. Cross-departmental collaborative teaching is a creative way to use existing resources to teach new and important subjects. Collaboration is crucial in today’s global environment in order for any business to succeed — including higher education. In fact, the earlier we can get our students to know about collaboration and working in collaborative, interdisciplinary environments, the more successful they will be when they enter the workplace. Kevin and I both have a like-minded interest in understanding how disasters and crises occur and how they impact a society. We both bring different perspectives to the table in approaching this topic. Kevin brings his geological science expertise in looking at how the geology of the disaster can impact what happens to a community. On the other hand, I am interested in understanding how the disaster occurred in the first place, what it is, how to communicate and disseminate information as the disaster or crisis occurs, and informing communities of the resources needed in the aftermath of a disaster or crisis. We’re both very interested in how current digital and social media technologies can aid or hinder the public in these situations. Our like-minded interest in this area got us thinking about how we can bring our knowledge and expertise together for the students. Our goal was to create a unique educational, collaborative experience that would be fun, not time-intensive, and would allow the journalism and geological students to have a lab-like experience to explore and experiment ideas and topics together. The Digital Ninja Workshop was born. It was called such because of it being a quick-hit, four-hour workshop that is rogue in nature since it is outside the confines of the classroom in an informal yet structured learning environment. Students come away with digital-savvy skills and new knowledge about science and journalism that sets them apart from their classmates, making them Digital Ninjas. Our workshops focus on a specific disaster/crisis theme. Once we have our theme, we bring together journalism and science students for an afternoon to learn about each other’s fields within the context of that disaster/crisis and explore the contours of that theme. We then have the students apply the knowledge learned to specific exercises that allow the students to gain new digital and social media, communication, and technological skills. Our first workshop was focused on wildfires last fall. As wildfires are rampant in Southern California, we thought it made perfect sense to approach this topic as it is something that the students can relate to versus if it was something not as familiar to them geographically (e.g. tornadoes, hurricanes, etc.). 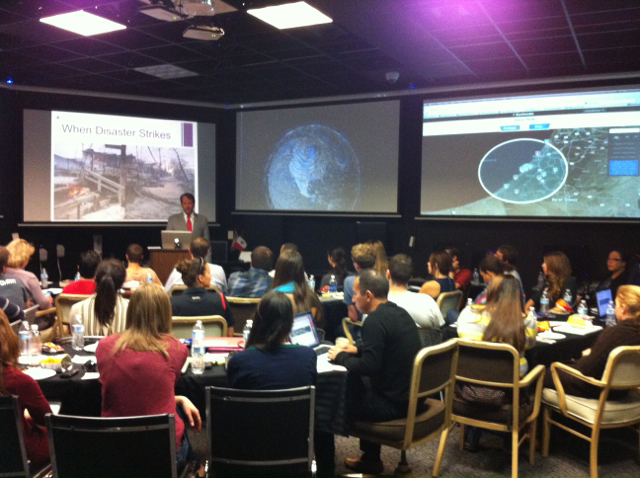 Our second workshop was on earthquakes this spring. Again, we selected a topic that would be familiar to the students — since earthquakes are prone to occur in Southern California. The students heard from a variety of experts during the afternoon workshop — including science faculty, earthquake experts, journalism faculty, emergency preparedness officials, and local journalists from the area. Each expert provided information and details on earthquakes and their impact. This workshop followed the same format as the other. In this workshop, the students were able to use iPads that were loaded with earthquake apps as well as the ArcGIS app to help map and show the impact of the hazards in an earthquake prone area. They were able to use Storify as a digital tool to disseminate and communicate their observations. The students also accessed the Digital Ninja website for mobile app tools relevant to their group activity. At the end of both workshops, we had a group of guest judges select the best group presentations and award them with a special iTunes prizes. Each student was also presented with a special Digital Ninja certificate. Both workshops were successful. Based on student evaluations from both workshops, all the students said they came away learning new information about each other’s disciplines, the crisis/disaster, and digital and social media tools they will use in the future. We’re in the planning stages for another workshop for the fall. We have some tips on how you can create your own Digital Ninja Workshop. Your workshop doesn’t have to be tied to journalism and science — it’s up to you and your potential collaborators/colleagues at your own institution to identify which subjects or themes you may want to explore with your students. These are just general guidelines to help you get started. Identify collaborators or colleagues you want to work with across fields/disciplines at your university. The premise is to collaborate with a long-term goal in mind. Kevin and I started this workshop as we were already working on a collaborative research project and we thought this might be a good next step. Set up several meetings to discuss what the goals and objectives of the workshop will be. Kevin and I met several times over the summer last year before we launched our workshop in the fall to figure out what we wanted the students to get out of the workshop in terms of learning outcomes and how we could achieve those. We came up with many ideas and threw them at the wall — some stuck and others didn’t. It’s a process that takes time. Grassroots efforts make a big difference. Kevin and I could not launch this workshop alone — it entailed reaching out to the students and getting them behind the idea as well. I am faculty adviser for my local student chapter of Society of Professional Journalists, and Kevin knew the president of the local geology student chapter on our campus. We invited both student groups to be hosts and participants of the workshop. If the students aren’t going to be involved and interested, you won’t have a workshop. Don’t do it all in house. It’s great to rely on faculty and staff within your fields, but if you want to provide a well-rounded experience for the students, identify key stakeholders or individuals from outside the university to come and be a part of the workshop. They can be speakers, mentors, instructors or judges at the workshop. They can provide another level of insight and learning at the workshop for the students. Make it a social experience. Workshops only work if you give people a chance to get to know each other. We were able to get some funding to pay for lunch and refreshments so the students could get to know each other over food at the beginning of the workshop. I also created an icebreaker activity at the beginning of the workshop to help get the conversation going between the students. Don’t allow them to put themselves in groups. For these kind of collaborative, interdisciplinary workshops, you want to assign students to groups and make sure they are diverse by discipline. That is truly when the learning will occur. If you give the students a chance to pick their own groups, they will likely stick with the people they know or are in their own discipline. It’s normal to do so, but these workshops must operate differently. Have a schedule. It’s important that the workshop has structure so you can coordinate when the experts will talk, when breaks will happen and when the students will be placed in their groups. It’s important to give enough time for each so that conversation and collaboration can occur. But don’t make it too rigid where there is no room for exploration and experimentation. Make a group activity. Create a group activity that will scaffold the learning from the workshop and allow them to immediately apply what they have learned. We have found that creating scenarios and then giving them a few digital tools to use, explore and apply – is a great combination. Make it a competition. We are naturally competitive by spirit. Set up some kind of competition in the workshop that will help to motivate the groups when they are doing their group activity and it will contribute to a unique learning experience. Make it official. We wanted the students to know that these workshops were not just happenstance but were important and useful for them. We created official flyers announcing the workshop, collected RSVPs (so we had a small manageable group), created a website for use during the workshop, and created certificates that they could proudly display on their desk or at home. Evaluate. We conducted evaluations after each workshop to collect the students’ feedback and to get a better understanding of what worked and didn’t. Based on our first workshop, we made adjustments to make our second workshop better. We are now looking at ways to improve our next workshop for the fall. Again, these are just a few tips to help you get started. We’re still learning a lot along the way and will be doing some exciting new things with our next set of Digital Ninja Workshops in the fall, so it’s a continual process of improvement. Feel free to drop us a line if you want to chat more about making your own Digital Ninja Workshop. We are happy to share our knowledge gained so far as you embark on your own ninja journey! I hope people will listen to you . 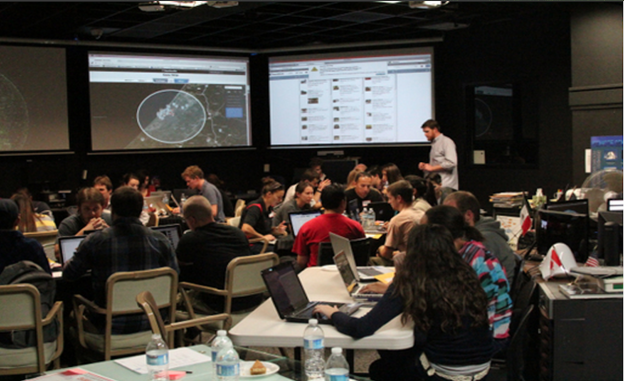 Consider looking at Open Space Technology as you develop the workshop. Thanks Dave, this is a great tip!